The Ascension of the Lord was the confirmation of the Catholic Faith, that we may surely believe in the gift which is yet to come, from that miracle whose effect we have already felt; and that every one of the faithful, having already received such great things, may learn to hope for the things which have been promised, and through those which he knows have already been given, and hold the goodness of God, both past and present, as a pledge of the things which shall come later. 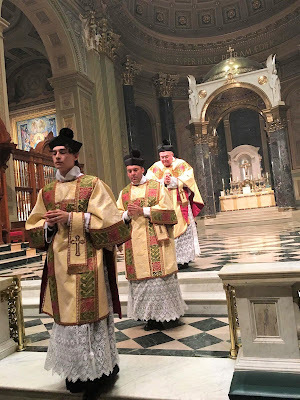 Courtesy of James Griffin, here are some photos of the Mass of the Ascension celebrated at the Cathedral-Basilica of Ss Peter and Paul in Philadelphia. Especially note the extinguishing of the Paschal candle in third photo. Mr Griffin is also the author of the blog Modern Medievalism.